As tortillas battle with white bread for the top ranking in the U.S., and corn-based chip consumption rises every year, manufacturers continue to look for high speed, durable equipment to supply these popular food products. Making corn tortillas and chips begins with an ample supply of masa produced by top of the line machinery. AC Horn Manufacturing supplies world-class masa mills, known for their speed and durability. Our mills are capable of processing up to 2,500 to 6,000 lbs of finished masa (50% moisture content) per hour. The robust durability of the Horn Masa Mill rests on the incorporation of a Nihard alloy plate into the equipment design. This unique mill plate is capable of processing up to 10 million pounds of masa before needing a replacement. In contrast, other mill manufacturers use stone and aluminum oxide mill plates, which wear down much more quickly and require constant adjustment to maintain a consistent grind. 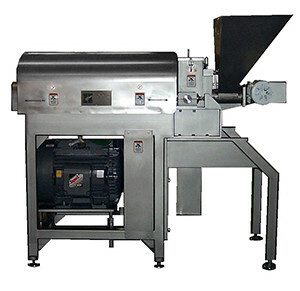 The Horn stoneless Masa Mill eliminates the challenges associated with both other mill styles. As a result, this leads to lower costs, less maintenance and lower expenditures to replace parts. The Horn Masa Mill is based on the principles used in nut butter mills. One key feature our machine provides the user is definitive control over the grind with repeatability—each grind will produce ingredients to the exact specifications the processor requires. By design, our mill maintains the grinding plates within a parallel structure. Tramming our Masa Mill is an easy process with our digital display and motorized actuation. In fact, we’ve patented our plate tramming process. Operators can adjust for tram within .003-inch TIR (total indicator reading), and this can be accomplished in a quarter of the time it takes to tram a nut butter mill. Once the mill is trammed to within a thousandth of an inch, this can be maintained for the lifespan of the grinding plate, to ensure a consistent product run for millions of pounds of masa. Horn Masa Mills are the choice of major tortilla and chip manufacturers around the country. Our support team works together with customers to install Masa Mills into their complete tortilla and corn chip processing lines. Corn Tortillas & Chips Equipment ? Our Stoneless Masa mill creates a new benchmark for superiority that other mills fail to meet. Instead of stone or aluminum oxide plates, its design and construction relies on proprietary Nihard alloy plates. The durability of our Nihard alloy plates allows for greater precision grinding than either stone-based mills or those using aluminum oxide plates. Stones are subject to chipping, creating an inconsistent mill surface that reduces product uniformity. Rocks, metal and foreign debris, common in masa processing, won’t affect the precision performance of our Nihard alloy plates. Our system also saves you time and the expense of installing a second “downstream” piece of equipment for de-stoning. In comparison to aluminum oxide, there is no comparison. Our tough Nihard alloy plates provide consistent product from run to run without the frequent adjustment required by aluminum plates. The durability supplied by the Nihard alloy is rated at approximately 10 million pounds of processed masa before replacement is needed. In general, you can expect product throughput between 2,500 to 6,000 lbs/hr of finished masa. For the most rugged, durable and dependable masa mill in the market, turn to AC Horn Manufacturing.